The potential for artificial intelligence (AI) and machine learning to transform the healthcare field is huge, with studies already finding diagnostic platforms outperforming their future human colleagues in terms of speed and accuracy. Take-up has been slow, however, with relatively few examples of active AI tools on medicine’s front lines. What is accounting for this delay, and to what extent are we currently witnessing a cultural shift? Patrick Kingsland investigates. Machine learning has long been touted as the next big thing for healthcare. With countless start-ups investing in that promise, applications are emerging across everything from diagnostics to drug discovery. There is a political momentum here as well as a scientific one. In May, UK Prime Minster Theresa May set targets for a “whole new industry around AI in healthcare”, stating that AI could prevent up to 22,000 annual deaths from cancer by 2033. Her plans were described as ‘pioneering’ by Cancer Research UK, which added that advances in detection technology ‘have the potential to save hundreds of thousands of lives every year’. So how are machine-learning techniques being used currently, and what kind of opportunities could be on the cards? While human radiologists will not lose their jobs any time soon, deep learning computers are already beginning to outpace them in diagnosing certain cancers. This, at any rate, was the verdict of several recent papers, which explored machinelearning applications within oncology. In one paper, published in the Journal of Medical Imaging, a team at Case Western Reserve demonstrated that machine learning might have the edge when it comes to picking out malignant lung nodules. Human radiologists have a tough job here – of all the ‘suspicious’ or ‘indeterminate’ nodules that are flagged up on a CAT scan, around 98% turn out to be benign. The study found that a computational imaging technique was 5–8% more accurate. In a third study, published in Annals of Oncology, researchers showed that a deep-learning conventional neural network could diagnose skin cancer better than dermatologists. The network was trained to tell the difference between benign moles and malignant melanomas. Compared with the control group of dermatologists, it missed fewer melanomas and misdiagnosed fewer moles as cancerous. “When I came across recent reports on deep-learning algorithms that outperform human experts in specific tasks, I immediately knew that we had to explore these AI algorithms for diagnosing melanoma,” said study author Professor Holger Haenssle, of the University of Heidelberg in Germany. AI is also being used to analyse molecular information from cancer patients, identifying people who may respond to certain therapies despite falling outside the target demographic. A recent study used machine-learning techniques to find ‘hidden responders’ – patients who slip through the net when using conventional sequencing strategies. While CT scans can be used to diagnose the condition, it can be hard to estimate exactly how far the disease has spread. Knowing that could be hugely helpful, as it could help flag up patients who are unsuited to certain medications, as well as assessing their dementia risk. The software learned to detect SVD by analysing more than 1,000 CT scans from stroke patients. According to results published in the journal Radiology, it was 85% more accurate than an MRI scan (the ‘gold standard’ of diagnosis) in predicting the severity of the condition. “This is a first step in making a scanreading tool that could be useful in mining large routine scan data sets and, after more testing, might aid patient assessment at hospital admission with stroke," said Professor Joanna Wardlaw, head of neuroimaging sciences at the University of Edinburgh. It is not the first time this year that machine learning has been used in the service of stroke patients. In March, a team from the Medical University of South Carolina and the University of Tennessee Health Sciences Center studied a device called the Cerebrotech Visor that can detect a stroke within seconds. Since the device can tell the difference between minor and severe strokes, it could enable a personalised approach to treatment. Machine learning has also been used to predict epileptic seizures. Researchers at the University of Sydney are working towards a portable, affordable device that could be used by people with treatmentresistant epilepsy. This device uses an algorithm that reads a patient’s EEG data. It predicts if they will have a seizure to 81.4% accuracy, giving them a 30-minute warning and time to find somewhere safe. The system learns as brain patterns change, and will become more sensitive over time. Meanwhile, researchers in Massachusetts have developed machine-learning models that can predict patients’ risk of contracting C. difficile. This widespread infection is a huge problem for hospitals, and kills around 30,000 Americans every year. The model was able to generate daily risk scores for each patient, classing certain people as high-risk well before their actual diagnosis. Machine learning also has its uses within mental health, with a number of start-ups developing apps that detect symptoms of depression. Cogito, for example, merges a number of AI techniques to analyse communication patterns. Its Cogito Companion app, trialled on patients at Massachusetts General Hospital, uses voice analysis tools as a gauge of well-being. As should be clear, this rundown is far from an exhaustive list. New ideas and applications are emerging all the time, with powerful implications across the med-tech sector. As machinelearning techniques grow more sophisticated, we will surely start to move beyond speculation and into the realm of everyday applications. Growth opportunities are hard to come by without significant investment, argue consultants at Accenture, but one major opportunity is a self-running engine for growth in healthcare: artificial intelligence (AI). 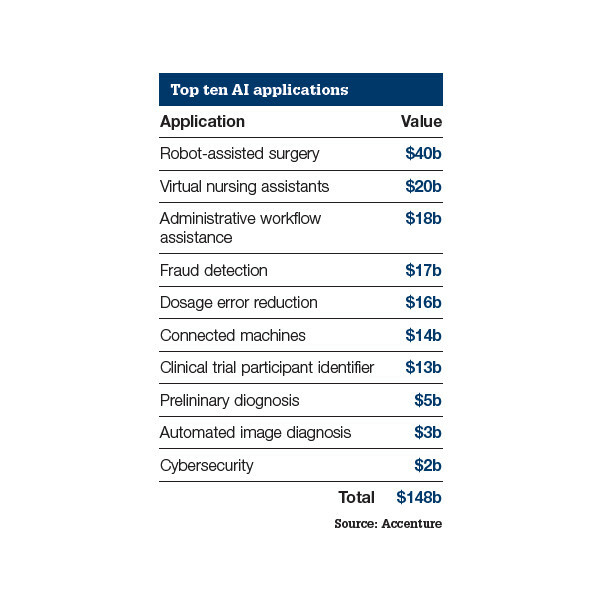 According to analysis by the company, when combined, key clinical health AI applications can potentially create roughly $150 billion in annual savings for the US healthcare economy by 2026. At hyperspeed, AI is rewiring our modern conception of healthcare delivery. AI in health represents a collection of multiple technologies enabling machines to sense, comprehend, act and learn, so they can perform administrative and clinical healthcare functions. Unlike legacy technologies that are only algorithms or tools that complement a human, health AI today can truly augment human activity – taking over tasks that range from medical imaging to risk analysis to diagnosing health conditions. With immense power to unleash improvements in cost, quality and access, AI is exploding in popularity. Growth in the AI health market is expected to reach $6.6 billion by 2021 – that’s a compound annual growth rate of 40%. In just the next five years, the health AI market is predicted to grow more than ten times over.